Ankh = Life: Risen From The Dead Post: Why The Ankh? Risen From The Dead Post: Why The Ankh? In retrospect, given the name of this blog, I really should have considered that option sooner. So! It's been almost two months since my last post. There's a reason for this, I promise. It has little to do with a lack of desire, and everything to do with the work shift that was thrown in my face. More on that on my next post. I'm very glad I was asked this question. It reminded me to take a second to reflect on the reason I began this blog to begin with, my "endgame" goal for it, and the sorts of things I wanted to write about in here. After a hiatus this long, it's easy to forget. That's not answering the question, though, so we'll just go ahead and sweep this under the rug....just like...this.....there we go. What about the lump in the rug now? Pretend it's your annoying kid sister who always wants to play with you, so you offer to play hide-and-seek and tell her to hide, then proceed to completely ignore her. Back in mid-December, when I decided to start a blog, I knew straight away what my biggest hurdle was going to be as far as getting this train wreck up and running. It's the same problem everybody has about a billion times in their lives: wtf should I name it? 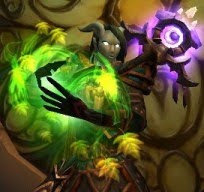 I knew that there weren't a lot of Resto Shaman blogs about, so I wasn't particularly limited as far as naming the blog after one of a Shaman's spells. I didn't like the idea, though, since it forfeited any sense of originality I have (but can only produce if I really try). Plus, If Resto Shaman blogs ever became the new 'in' thing, I would undoubtedly find myself competing with other blogs of a similar name (and they'd probably do it better than me). I wanted a name that was not only original, but also unique to some aspect of WoW's Shaman. The three options I was mulling about were Totems, Shields, and self-resurrection. Totems were way too obvious for me. It'd have been akin to seeing a billboard that proudly stated, "McBurger's: We Sell Burgers". It just comes on too strong. Shields were immediately nixed since the theme was already being used by somebody whose blog had helped me numerous times before and after I started my own, and it felt somehow disrespectful to take up a similar name. I was left with self-resurrection. How could I rework the idea of Reincarnation into a blog name? I didn't know. Still don't. I liked the idea (as I've always liked the spell), so I had to work around my inability to do anything clever with the word "reincarnation". Which was admittedly much easier to do. The spell is practically synonymous to the reagent needed to cast it - the ankh. At this point, I had something to work with. Ultimately, I decided on "Ankh = Life" due to its deceit. When you first look at the title, you might think that I really, really like Ankhs. In truth, I have no strong feeling toward or against them. I never looked up lore on them, read college papers on their origins, anything like that. Upon closer conjecture of the title, though, taking it in context with what it's used for in the game, you might surmise that the title isn't based on an obsessed opinion, but a simple statement of fact. The Ankh gives you life (or, at least, a second shot at it until you realize you just resurrected in fire). It is, in Mario turns, the green mushroom. And we all love those delicious green mushrooms. Now does anybody actually think about this when they look at my blog's name, or do they just see it as another name for another WoW blog? I don't know! But I also don't care. Because I like the name. And I hope you do too (or at least don't hate it enough to not come back). Thanks so much, mysterious Ankh Tattoo artist, for asking! Well, since I am a fellow WoW player, my thoughts went to "shaman!" since I saw ankh and the symbol. But I definitely see why the tattoo artist came here, thinking it was something different entirely. And you're totally right, naming blogs is HARD! I did the boring class related phrase/ability thing for my first blog, then tried to do something different with this current iteration ("Oh look, an alt!") which... I liked for about five minutes, but by that time, it was too late. Meh. Hopefully the next name, I'll like! Naming ANYTHING is hard! I'm going to feel so very, very sorry for any child I may have. "I'd like you to meet my kids. Here we have Harry, and Sally, and this little bugger's Destructo the Destructinator. He's my li'l angel."